Saga Pearl II goes into retirement in 2019 but for now, she is polished to the nines with new carpets and blinds, shiny woodwork and upgraded furniture on the outside Verandah Deck. She’s stylish and comfortable with a soft nautical feel to the decor in varying restful shades of blue and cream. The 400-passenger vessel is a smart but it is really the crew who make this classic cruise ship an absolute gem. Captain Nick Sunderland is always about and he runs a 3.45pm Captain’s Corner so anyone can join him to talk about the ship or the ship’s course, the weather, manoeuvres, ports or whatever’s on their mind. It’s a nice touch and on such a small ship it’s a manageable task. Capt Sunderland’s crew are all equally friendly and welcoming – you can feel Saga Pearl II is a happy ship. There’s a high crew to passenger ratio (400 guests to 250 crew) which makes for a more relaxed environment and no crew member passes without saying ‘hello’ and the warm smiles feel genuine, rather than those shallow ‘Have a nice day’ lines that sound so empty. A ‘Girl Power’ team keep the hotel and tours side running like clockwork. Hotel director Dawn Cartwright, ensures everything’s shipshape and Saga fashion; Hannah Page on Food and Beverage uses plenty of shoe leather ensuring mealtimes are a smooth operations and Jacquie Forbes- Watson finely tuned tours with care and precision. Baltic cruises can be busy (requiring back-to-back tours if guests want to make the most of cities during overnight stays) so an expert such as Jackie helped guests make the most of time ashore. At each port a free shuttle bus runs from the ship to the town centre so there’s no need to book excursions every day. St Petersburg is an exception and it is here passengers need to travel with a guide (unless they have arranged a separate visa before leaving the UK). The city is so vast that only well-travelled passengers should attempt to go ‘off-piste’. Time is not on cruise passengers’ side when visiting the summer palaces which are about 25 miles from the port. Back on board there is plenty of daytime entertainment, especially on sea days with more talks and classes than anyone could possibly attend! Evening entertainment has been ramped up and top of the bill, Matt Lewis, a US Elvis impersonator hit the mark. Matt is far more used to thousands of screaming fans in Las Vegas but he built a rapport with the British passengers who were up dancing and even waiting around after the show to get their photos taken with him. Well done, Saga, something different and a great success. Passenger Cindy Smith said: “The Elvis Presley theme caught my attention when choosing a cruise. Matt Lewis was a superb tribute artist and, like Elvis, he was funny, self-deprecating and a first-rate entertainer. The 40th anniversary of the King of rock ‘n’ roll’s death was commemorated with three shows; each one getting livelier as the cruise went on and culminating in a Graceland Party. Fine dining is also close to the passengers’ hearts. There are two restaurants – the main dining room with waiter service and The Verandah which offers buffet service. The same menu is served in both restaurants and the fine dining often features locally sourced produce such as seafood and cheeses. If the weather’s good passengers can eat al fresco and a lunchtime barbecue, outside the Sundowner Bar offers choices of meat, fish and vegetables. 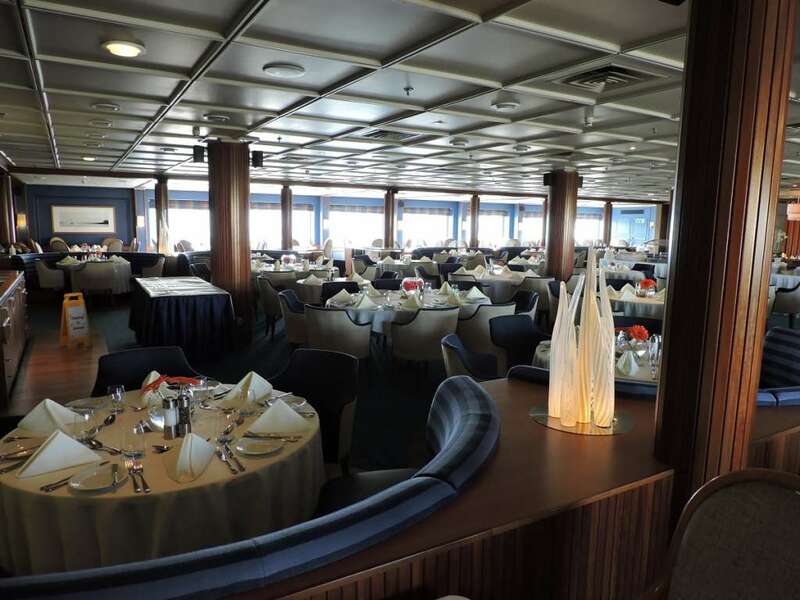 Gala buffets are a Saga speciality and executive chef Dirk Rosessler and his team really ‘pushed the boat out’ with a banquet during the sailaway from Stockholm. They surpassed themselves with a Baltic extravaganza in St Petersburg – caviar, stroganoff and pavlova being highlights of a grand spread, plus the Graceland party with dishes named after Elvis songs! Exercise is key to work off the calories so guests can Walk a Mile round the top deck, join in the fitness classes or use the gym. There is an outdoor and indoor pool – neither are huge but they are spotlessly clean and inviting. At the Spa, Nadia is the queen of massages and facials, and refreshingly she doesn’t keep trying to sell anything during the treatment. Three cheers for Nadia! The Library is a top feature on Saga Pearl II. 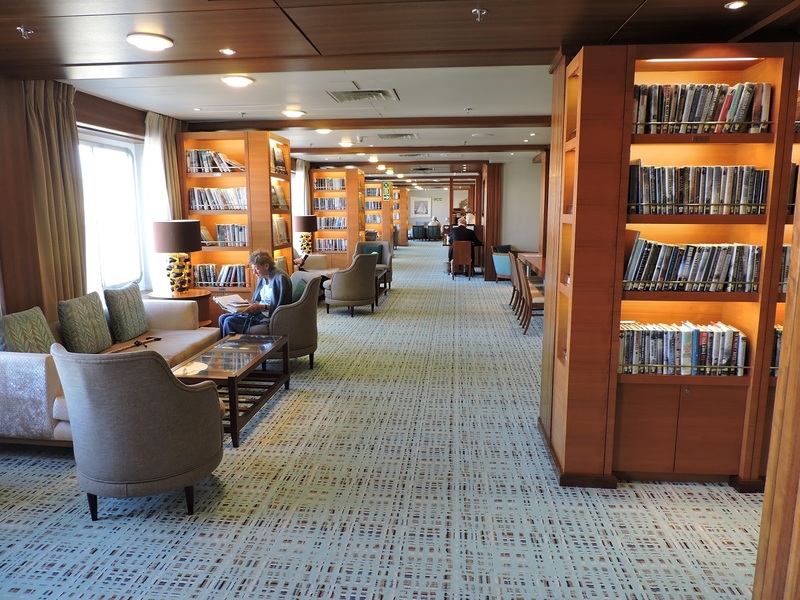 It is one of the largest at sea with more than 2,000 books and an array of magazines from travel to gardening. There are plenty of huge sofas and lounge chairs, plus the library adjoins the Shackleton Bar so guests settle in with a book and their favourite tipple. A quiet space on a ship is always a good find. The wifi speed is much improved on Saga Pearl II and free to use. The code is on your ship ID card so there’s no need to keep rushing down to reception for access. After busy days ashore, room service is also a happy alternative to eating in the restaurants and the meals arrive hot and well-presented. Cabin sizes are generous and there is a butler service for passengers who choose a suite or junior suite. Junior Suites have a double or two single beds, a coffee table and chairs, a desk, ample wardrobe space, a bath with shower, a good-size television and UK plug sockets. Butler service includes replenishment of the mini-bar with a choice of drinks, a range of spirits, delivery of canapés and the dinner menu every evening as well treats such as chocolate-covered strawberries. However, the pièce de résistance is the complimentary laundry service which is included when staying in a suite or if guests are Britannia Club gold members – that’s having 150 cruise nights under their belt. 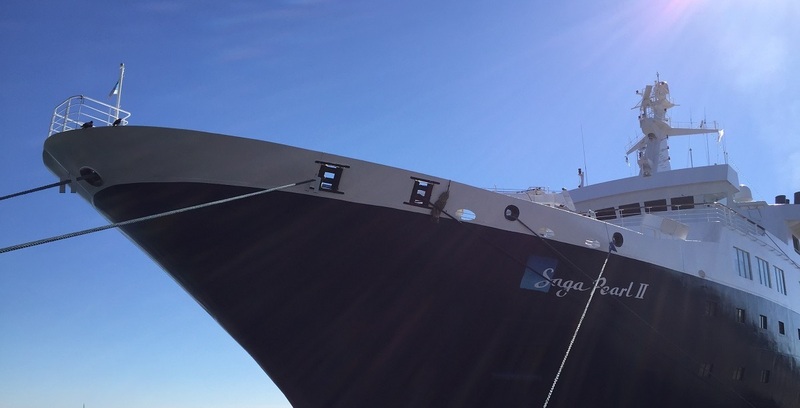 All this, plus a return chauffeur service demonstrates Saga knows a way to passengers’ hearts – and Saga Pearl II is certainly a Pearl of the Seas. 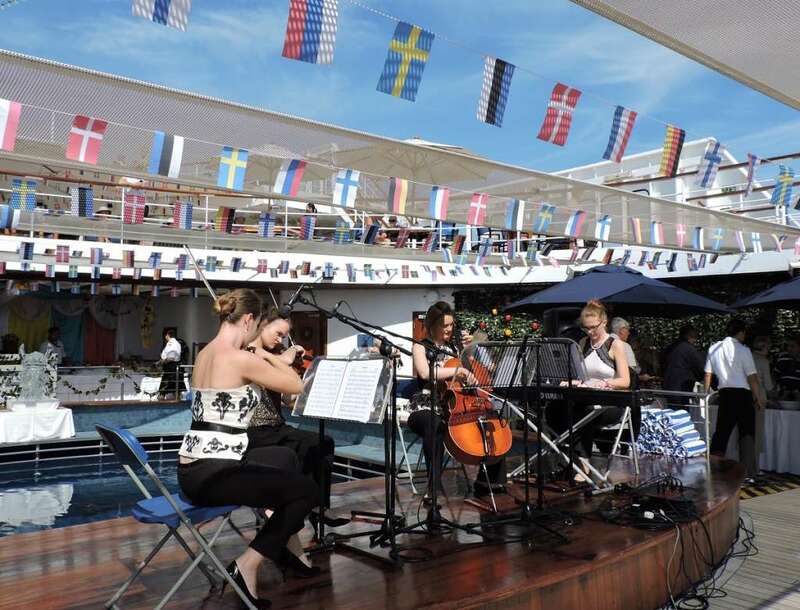 Lesley Bellew sailed on the all-inclusive White Nights of the Baltic cruise. A similar sailing on Saga Pearl II, The Majestic Baltic cruise, departs from Dover on May 22, 2018. 14 nights from £2,825, with calls to Gdansk, Poland; Tallinn, Estonia; St Petersburg, Russia; Kotka, Finland; Visby and Karlskrona, Sweden and Kiel, Germany.